Quinado Fandango ~~ Someone mentioned Quinado Fandango on facebook. This photo was taken of him when Barbara Franklin owned him. QF was raised by DCCI and sold to Kassel Ost Ranch of Saline, MI as a weaning calf for $400. His sire was Don Quinado who was by Don Quixote and out of Twisty Matilda by Texas Ranger. His dam was a beautifully speckled dark wine colored Wright cow. 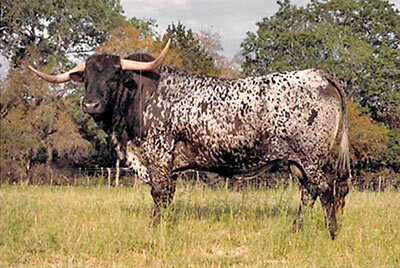 He sired some very colorful cows and certain ones had a lot of horn for that day.